In 2018, a partnership between Fare and the international campaign Football v Homophobia will fund 21 organisations to deliver football activities during the period. Albanian organisation Intelektualet e rinj, Shprese is running a two-day workshop on LGBT+ rights for the Football v Homophobia month of action. The workshops will touch upon topics including human rights, gender and sexual orientation, anti-discrimination and aim to have a cascading effect among the youth attending and their communities. It will also include a film screening. Attendants will include representatives from the Albanian Youth Parliament and players from football Academy of Vllaznia. 100 people will be attend the premiere of the short documentary “Der Tag Wird Kommen”, which follows the life of Oliver Egger, a gay footballer playing for FC Gratkorn and his struggles as a gay footballer as part of FreundInnen der Friedhofstribüne activities for the Football v Homophobia month of action. The screening will be followed by a panel with the player himself and the director. To attend send an email to freunde.der@friedhofstribüne. Based in Tuzla Omladinski resursni centar Tuzla will be running a workshop for 15+ aged youngsters on the LGBT+ rights. The workshop will take place on 16 February and will be preceded by a football tournament for teams representing the different areas of study of the Universty of Tuzla and high school students on 11 February. The tournament will be held under the theme ‘Equality in society’. On Friday 9 February, Helsinki Sports International Ry will host a panel discussion on sport and LGBT+ rights. Representatives of rights and sport organisations will be invited to address the challenges to participation in grassroots sport and discrimination faced by the LGBT+ community. The panel will also include delegates from the Helsinki city council and other civil rights organisations. It will kick-start at 7pm and will be followed by a 7-a-side football mixed tournament. French gay club Football Club Paris Arc-En-Ciel is organising a 5-a-side tournament with workshops to discuss anti-gay language commonly used in football and barriers to inclusion for minorities. The workshops will take place during the tournament. At the end, there will be a social gathering and videos of the event and testimonials will be screened. The event is open to all, registration is mandatory. Mifalot is using their social media channels to support the Football v Homophobia month of action. New Israel Fund anti-discrimination campaign Kick It Out Israel organised a “Colours of the Rainbow” friendly match between the Rainball mixed LGBTQ straight team and a Team of Artists at the Ramat Gan National Stadium. The match counted with the guest appearance in the Rainball team of Roy Ohana, Israel’s first transgender player. Здружение за културен и медиумски активизам КВИР СКВЕР Скопје will host roundtable on tackling homophobia in football thought to be the first to bring together national LGBT+ rights groups and football authorities, as well as players, coaches and referees. At the event, the human rights NGO will present the FvH toolkit in Macedonian, published in 2017 in cooperation with Pride Sports. The event is open to all, registration is required. A Q+A and panel discussion will be held on 7 February for school children in Podgorica. The session will be organised by KULSPORT and will focus on fighting homophobia, trans-phobia and reporting homo and trans-phobic bullying. Participants will have the opportunity to ask questions and share their opinion about topics covered. After the panel, a football training will be organised with professional players. On 10 February Fare Polish member KS CHRZĄSZCZYKI will host a screening of the documentary “The Chosen Few” followed by a discussion on LGBTQ+ representation and visibility in Polish football and the need for clubs/events LGBTQ+. On the following day, a football tournament will be held in OSiR Targowek. Registration and participation fee of 50 euros is required per team. The players will wear FvH branded t-shirts, which will continue to be used throughout the year in other tournaments to promote the campaign. Asociatia MozaiQ LGBT will organised the first LGBT+ friendly tournament in Bucharest. Teams will come from cities including Bucharest, Cluj, Iasi to contest the tournament. The tournament is planned to take place during three days: Day 1 will include the opening ceremony and a panel discussion on LGBT discrimination in sports; Day 2 the group stages; and, Day 3 the finals. On 17 February Общественное движение ЛГБТ “Реверс” will hold a friendly match aimed at promoting equality and fighting homophobia, which will be followed by a seminar on LGBT+ rights on 18 February. Russian LGBT Sport Federation is running a series of activities during the Football v Homophobia month of action across six Russian cities, four of which World Cup host cities, aimed at capacitate the LGBT community to empower them. In Slovakia, the celebrations of the Football v Homophobia month of action will kick-off on 20 February with the screening of FC ROMA followed by a discussion on racism and homophobia and intolerance in sport. On 23-24 February LGBTIQ organisations from across the country will come together to contest a football tournament. In addition to this, a discussion and exhibition on Black History will be held with HRC Global NYC on 27 February. The latter will be organised with the United States Ambassy and will be open to the public. Registration is required. Fare member Out in Slovenija will use the momentum created around the UEFA Euro Futsal Championship, which will take place in Ljubljana between 30 January and 10 February, to create a national debate around homophobia in football. The Slovenia LGBT rights organisation will invite the English gay referee Ryan Atkin for a roundtable on the topic. A series of activities will be held in Murcia to mark the Football v Homophobia month of action in 2018 organised by CAP Ciudad de Murcia in collaboration with the LGBT+ association “No Te Prives”. These will include: distribution of flyers about sexuality and sexual orientation among fans and local businesses; on the week commencing on 12 February workshops will be held to create awareness of LGBT-phobia and educate on diversity; information stalls will provide information to fans on match days. La Liga club C.D.Leganés are dedicating their match against Real Madrid to the fight against homophobia. FELGBT is launching for the forth consecutive year the campaign #LaLigaArcoIris that aims to unite fans, clubs and the wider audience under the same umbrella to fight LGBT-phobia in football. The annual film festival organised by the charity arm of the La Liga club Athletic Club de Bilbao will in 2018 pay homage to Justin Fashanu, the first professional footballer to be openly gay, and further discussions around homophobia in football. Fan group Kolectivo Sur will join the Football v Homophobia month of action when on 23 February they host a roundtable on LGBT-inclusion and on 25 February a 7-a-side match under the same topic. Observatorio Español contra la LGBTfobia, an organisation focused on monitoring incidents of LGBT-phobia in Spain, will launch on 19 February a nation-wide campaign to increase the visibility of the LGBT+ community in football. The launch will be at the Superior Council of Sports, a government body that oversees sport in Spain, in Madrid, and will be attended by sports authorities, players, football associations and clubs. An exhibition on the same topic will tour around several Spanish cities including Sevilla, Málaga,Toledo, Valencia and Valladolid. The sports department of Torremolinos City Council is hosting the exhibition “El armario deportivo abre sus puertas: Diversidad afectivo-sexual y de géneros en el Deporte y la Educación Física” about open gay athletes, sexual and gender diversity in sport and physical education. The exhibition brings together work developed by the Junta de Andalucía work group CEP Málaga and the panels of Fundación ARCO IRIS and Federación Andaluza LGBTI+ developed for the Fare Football People action weeks in 2017. Associations involved in the project include Prensa Deportiva de Andalucía, Almeria con Orgullo, Roja Directa, Trans Huellas, Granada Visible, Solid@arios Sport, Amnesty International, the universities of Malaga and Seville, the fans group Nena Cadistas and the football clubs Granada FC, Cadiz FC, Sporting de Huelva. Unión Deportiva Aspense and their fan group Comando Torrija are joining forces to tackle homofobia. Together, they will distribute informative flyers at all their matches in February. On the 24 February Queerstion media will facilitate a mind and body workshop on the impact of hate speech and discrimination on the wellbeing, safety and security of Trans people. It will explore strategies to cope with trauma, stress and also share tips on safety. The Swedish group will work on the event with LGBT+ ethnic minority associations, including RFSL, Black Queers Sweden, Trans Community of Colour Tcoc and Find Hope. On the day after, Queerstion media will host the HATE HURTS football tournament to denounce all forms of hate and promote equality. As part of the celebrations of the Football v Homophobia month of action Liga Tolerantnosti will translate the Football v Homophobia Toolkit into Ukrainian and launch the resource during a panel discussion on 10 February. The panel will bring together representatives of sport clubs, local authorities, NGOs and LGBTQI groups. 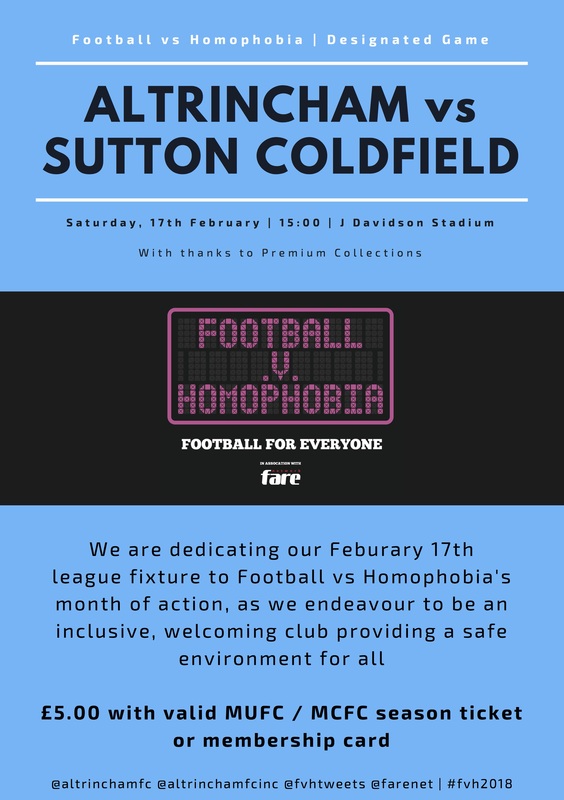 On 17 February Altrincham Football Club will be designating their league match against Sutton Coldfield Town FC as a Football v Homophobia match. The team will wear FvH t-shirts during the warm-up before the match and wear rainbow laces. On the day, Altrincham Football Club will help showcase the work of Trafford Pride and a range of agencies from LGBTIQ community. A day after, Altrincham FC Ladies will also designate their match against Crewe Alexandra to FvH. The club will deliver workshops in our local high schools with the help of FvH to showcase the importance of inclusion and LGBTIQ participation in football. On Sunday 18 February Yorkshire St. Pauli will host an exhibition football match and educational workshop as part their Football For All project, comprised of refugees and asylum seekers and long term residents. The workshop will focus on tackling homophobia and transphobia and raising awareness about the barriers to football for the LGBT community. The workshop will be hands on (not a lecture) with practical involvement to try engage the players as much as possible. On 22 February the National Football Museum will organise a workshop on South American women’s football which will address issues of sexism, gender binary and LGBTIQ participation/ representation in football. The workshop will be held at Museum and will bring together leading scholars on South American women’s football to Europe. The event is open and free to all people who want to attend, registration is required. A larger conference, on International Women’s Day 8 and 9 March 2018 will bring together 30 of the leading academics on women’s football world wide. Speakers from USA, Canada, Europe and UK will present on equality and diversity themes, including Muslim and black and ethnic minority experiences and Jayne Caudwell will speak on LGBTIQ identities and the Rainbow laces campaign. The event is open to all who want to attend. Ahead of football fixtures in the last fortnight of February 2018 in England and Scotland, Pride in Football will produce short animations offering scripts for responses to homophobia heard in the stands, challenging homophobic language.